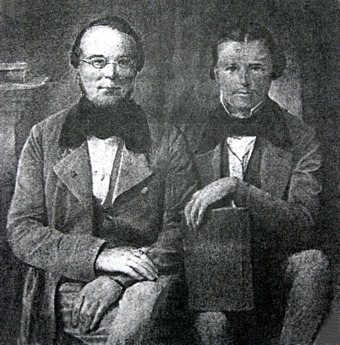 The Labitzky family were yet another example of father and son musicians. The family lived near Karlsbad (Karlovy Vary) in the present-day Czech Republic, on the edge of the old Austria-Hungarian Empire. The father, Josef Labitzky (1802–1881) became known as the Bohemian Waltz King. He started his career in a small travelling orchestra, then as violinist in the Marianbad Spa Orchestra, and then in Karlsbad. In 1823 he travelled extensively around Germany but in 1835 took over a reconstituted Karlsbad Spa Orchestra, one of the oldest orchestras in the world. He toured with this orchestra all over Europe and the titles of many of his compositions reflect the places he visited. He increased the size of the orchestra to 22 players and received city funding. He visited Russia several times and, like Johann Strauss, played at the pavilion in Pavlovsk and had several royal engagements. He came to London in 1844 and composed some 22 works associated with these islands, also playing for royalty. He made several publishing contracts which ensured his music became known throughout Europe. He handed the Spa orchestra over to his son August Labitzky (1832-1903) in 1867, who had studied at the Prague Conservatory. He and his also musical brother Wilhelm came to England in the 1850s, once again increasing the size of the orchestra first to 39, then 45 in 1877 and still more later, reflecting the trend towards larger orchestras during the 19th century. August Labitzky Son was not as prolific a composer as his father with some 50 works as compared to almost 300. The Labitzkys are still reasonably well known, with a proud history and their music is still played today in Karlsbad and actively promoted by the conductor of the Hotel Pupp Orchestra, Bohumir Häjek but it cannot be ranked in standing against that of Strauss Father and Son.